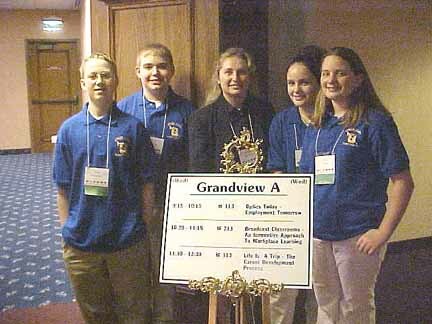 Danielle Olson, Chelsea Bromley, Todd Lyman and Tim Veverica traveled to Grand Rapids with Mrs. Warman, Miss Bishop and Mr. Peabody to represent Onekama Middle School at the 2002 Governors Conference on Career Development. Our student representatives prepared and presented a presentation entitled Broadcast ClassroomsAn Innovative Approach To Workplace Learning. The presentation included the methods used to produce a live news broadcast in our middle school and the importance of a good work ethic to be successful. They demonstrated a systematic approach to producing a news broadcast with the aid of digital cameras, pre-training activities, reflective materials, video editing and production equipment and an actual broadcast of Onekama News Live. There were 33 teachers, administrators and employers in the audience for the presentation. The audience eagerly listened to our students discuss the partnership Onekama News Live has developed with the Channel 9&10 News team to promote the employers perspective of a competent employee in the business of broadcast communications. Our students were very pleased to share with the audience the details of their discussions with Mr. Dan Farkas and Mr. Scott Michael Trager from Channel 9&10 News. Todd and Tim demonstrated how to use the digital cameras and explained how important it was to find a picture that tells a story. When Mr. Dan Farkas visited our school, he encouraged our news team to expand a story by clearly showing how it will impact the lives of their viewers. Tim and Todd discussed with the audience the art of taking pictures to promote the camaraderie within our school community. Todd Lyman told the audience that he really never "understood how much work takes place to prepare a broadcast" until he visited the Channel 9&10 News station. He said "the best part was seeing how many ways you can be in the news business without being in front of a camera." Tim Veverica described his experience at the Channel 9&10 News station as "a place to go behind the scenes and learn how a news anchor uses a teleprompt and how a weatherman uses a green screen." Chelsea and Danielle described to the audience how they mentor the younger students to prepare them for particular jobs as one of our news team members. A new criteria for our news team is to produce a Middle School Movie during each nine-week class period. Chelsea related to the audience the importance of being able to work together to make a successful news program and a movie production. The audience turned in their personal evaluations of our program to the Conference coordinators. 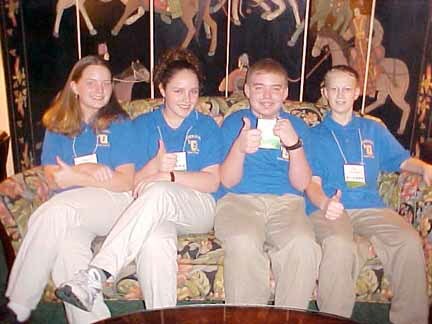 Our students received all "excellent" marks for the presentation and several comments commending them for their "professional attitude." Congratulations!